I apparently lacked a proper upbringing; it was not until I began to read this book that I heard the notion of the Garden of Eden being in Cuba; though in retrospect, when my parents spoke of Cuba, including my American Mother, and those Cubans of their generation, they did speak of Cuba as a paradise, all be it a lost paradise. I looked around the room and desperately wanted to read those words to someone and discuss the notion of little angels being good and devils not being cute. Another fail in my Cuban education; did all Cubans believe in good little angles and devils only being ugly? Yes, before you get upset, I only believe in one devil, but he does have many demons working for him, they too must be ugly. 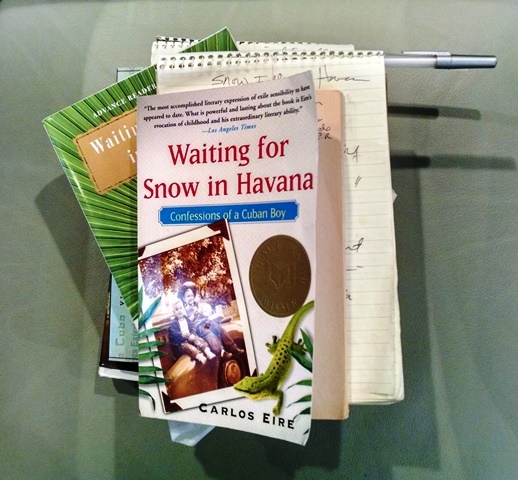 Months ago, I promised the copy of Waiting for Snow in Havana, which I was reading, to Marcial, sure that he would actually read it, if I gave it to him, and certain it would have some impact on him, though not the impact it has had on me; rather the impact appropriate for his reality. The truth is that I will not be giving him this copy, though Kate has already ordered one for his Christmas box. Not only has my copy been maligned by the length of time and the many trips it has taken, as I have tried to read it; but the need/desire to write in the book overtook my good intentions, of making notes in a spiral notebook, and it is now quite filled with check marks, asterisks, and lines. I have had this book in my life for a very long time. Originally, it was the Advanced Reader’s edition that I began to read; until I ran into a problem, I often have with anything written about Cuba, references to santeria, which normally causes me to throw the book away. But with Waiting for Snow in Havana, I put the book aside, deciding I needed to take a second look, at a different time; as the author’s remarks were unlike the offending references, in the past. Mr. Eire manages a paradox that I find most Cuban, when dealing with the supernatural or spiritual; he manages to show both an irreverence and respect for the divine and religion, his references to the objectionable Cuban curse, in this writer’s opinion, are used to set the scene and explain the culture, more so than to propagate an agenda or glorify evil. Reading his book, I was also taken aback, just a bit, by use of curse words, in a piece of non-fiction. Oddly, he too seemed to struggle with this issue, explaining it from a spiritual perspective, in terms of it being a sin and its impact on his soul. However, that is the beginning and the end of my criticism for this book. Mr. Eire’s master of language, both English and Spanish, were a delight! I felt like I was feasting, at the most delicious of banquets, although undeniably a table set with more than a few bitter dishes; as the writer deals with his childhood and the events that led to him becoming one of the 14,000 children that took part in the Operación Pedro Pan, Peter Pan Operation, which brought unaccompanied children to the United States, from Cuba, to escape communism and the fear of children being sent to the Soviet Union. This remarkable biography and book of history may not be for everyone, but I must say it has been a long time since I read something that I so wish I could discuss in a book club or at a perfect dinner party. I mean how can I read “Have mercy on me, Lord, I am a Cuban;” and not need to talk about it! Miserere mei, Domine, Cubanus sum. The writer takes us into his life in Cuba, as a child, and shares with us the moment the Revolution becomes a reality in Cuba, and its impact on his world, with intimacy and heartbreaking detail, while still managing to show us the joy, love, and wonder in life, which help define him. Obviously, the antagonist in this story is the evil that the Revolution and its perpetrators bring to Cuba, changing the author’s life irreparably, as well as more than a few of us. But his perspective is again that very Cuban quality of paradox, it is both deeply personal and yet universal, at least for those whose lives are crushed by loss from shattered dreams and realities, death and exile, hope and most poignantly, by the people that we love. “My grandmother would discern very soon after he assumed power that Fidel was up to no good at all. She had a way to tell. I have never read his grandmother’s perspective anywhere, in my studies; what a clear, simple, and yet profoundly accurate metric to assess Fidel; a man in whom so many put their faith, all be misguided. Fulgencio Batista had been president of Cuba, from 1940 -1944; he then returned to power on March 10, 1952, through a successful coup, staying in power until January 1, 1959, when the Revolution triumphed, while Mr. Eire slept. You may be ready for your coup de grâce; but beside the check marks, asterisks and lines, I did keep the spiral notebook with me, and filled it as I read, thus wrapping me this up is not easy. There is so much more I desire to share with you. “The bags looked like worms. Gusanos for the gusanos. Oh my, what an amazing mind Mr. Eire possesses. Or if you would like to understand why Cubans disdain the beloved Kennedy’s, by all means read what Mr. Eire says regarding the Bay of Pigs, where the brothers “nos embarcaron”. “And who ever heard of the good guys losing?” Sadly, Cubans, we know too well that good guys keep losing; while so many are blinded by false hope. “Blame it on the sun, and the sunlight. It makes as much sense as anything. With all that light, Cubans have a hard time letting go. Even I they only lived in the place for one day before being whisked away, the sunlight is forever trapped in their blood. We love much too deeply. I see this trait in my half-Cuban children, full blown at times, and they haven’t even been to Miami yet.” That is all for now. At least until I read Learning to Die in Miami. This entry was posted on December 1, 2018 at 12:01 am and is filed under From the Editor, LeftSide. You can follow any responses to this entry through the RSS 2.0 feed.